It’s Austin Beer Week, and this meal celebrates local produce, charcuterie, and craft beer all in one pot! In this easy recipe, bratwurst and chopped onions are browned in a skillet, and then slow cooked in a whole bottle of beer for half an hour. A bunch of dark greens are added in the last 5 minutes of cooking, creating a wholesome, hearty meal with great flavors. For my version of the dish I paired peppery mizuna from this week’s local box with Independence Brewing Co.’s Sunshine Wheat, but you can use any dark green and beer combination you have on hand. 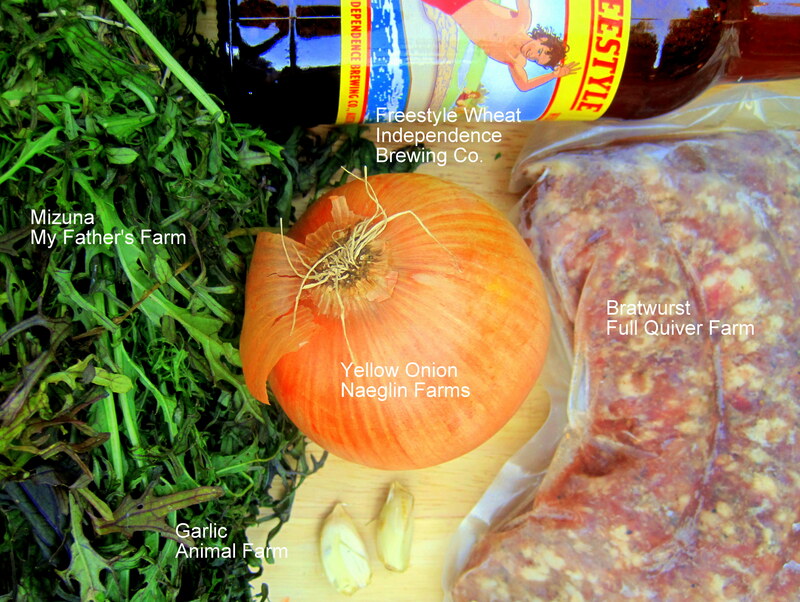 (The picture above is from another iteration of the recipe, in which I used arugula and Real Ale Oktoberfest. Yum.) I adapted this one-dish wonder from Anne Dailey’s recipe for Beer Braised Sausage at SustainableTable.com, a terrific slow food resource for home cooks. Slice onions. In a large skillet, saute onions in butter over medium heat for about 10 minutes. Meanwhile, peel and chop garlic. Add garlic and whole brats to the pan and brown sausage on all sides. Pour in entire bottle of beer, turn heat to low. Simmer, covered, for 30-45 minutes until beer has thickened some and sausages are cooked through. While sausage is cooking, chop greens. Cook greens with sausage and onions for the last 5 minutes on the stove, until they’re just wilted. Season with fresh ground pepper. The greens in this dish taste best the same day they’re cooked. However, the braised sausage and onions keep well and make excellent pizza toppings later in the week. I really like to pair them with shaved sweet potatoes or winter squash and goat cheese on homemade pizza dough. Wok-sauteed mizuna and chicken – Make a few substitutions here to use what you’re getting in your box. Specifically, add arugula to the mizuna (I doubt we’re going to get a full pound of either, so have them join forces with their peppery goodness). Also, use summer squash instead of the carrots – it’ll cook in slightly less time, but no matter. If you’ve never had mizuna before, you’re in for a treat. It’s much like arugula in flavor, but the leaves are a little more hardy, like mustard greens. 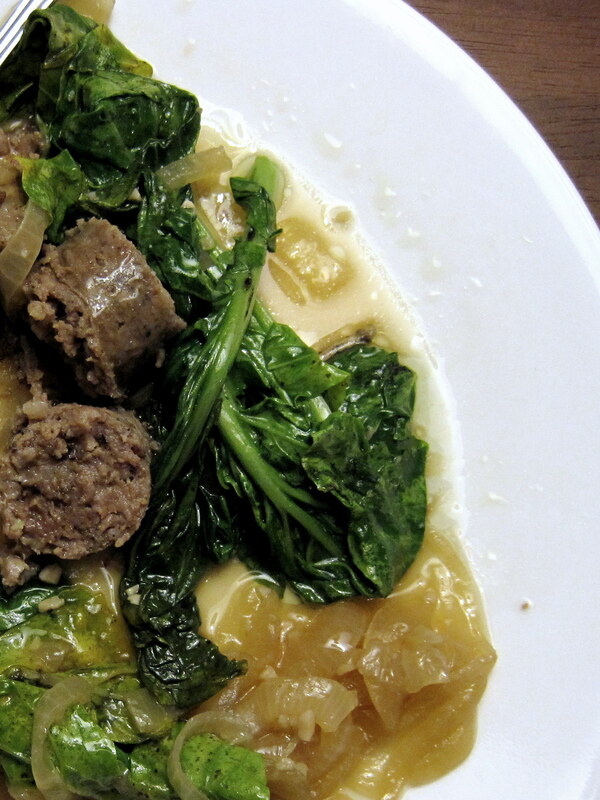 Vegetable stew with sunchokes – Again, we’ll need to make some substitutions. If you don’t get red potatoes, use your sweet potatoes or trimmed green beans (that may sound odd, but I promise it’ll taste good – we’re making this an all-purpose veggie stew). Use more zucchini in place of the carrots. Depending on the amount of sunchokes we get, you may be able to substitute the extra for celery. You can also toss in some eggplant if you want. Caramel apples! – It IS Halloween week, right? If you don’t want to go to the trouble of making your own caramel, just use one of those packaged mixes at the grocery store. I won’t tell. Eggplant burgers – I’m linking to a recipe here if you need a guide, but I imagine you can go a million different ways with eggplant burgers. I have some friends who made them Italian-style, with mozzarella and some red sauce on toasted buns. I’m thinking of using mustard, cheese, sliced radishes, and Bibb lettuce. Yum. Callaloo (creamy spinach and okra) – I’m excited about this recipe because 1) it involves coconut milk, and 2) I’m betting that pureeing everything together will negate the okra sliminess we’re always looking to avoid. Good times. I love this recipe for several reasons. First, it’s easy to fix. Second, it’s light and healthy. And finally, if you aren’t the biggest fan of broccoli rabe, there are a lot of flavors going on here to distract from it. You could also toss in some other veggies, such as zucchini, when you blanche the rabe if you need to use any up. Bring a large pot of salted water to a boil. Wash broccoli rabe and trim off about 1/2 inch from the bottom of the stems. Cut the stems and leaves into 3-inch pieces. Add it to the boiling water and cook until crisp-tender, 2 minutes. Using a slotted spoon, transfer the broccoli rabe to a large bowl of ice water. Once cooled, drain broccoli rabe and set aside. Add the fettuccine to the same pot of boiling water and cook until just tender, about 2 minutes. Drain, reserving 1/2 cup of cooking liquid. Meanwhile, bring the broth and lemon juice to a boil in a heavy large skillet over medium-high heat. Boil until the broth reduces by half, about 5 minutes. Add the chicken and simmer just until heated through, about 2 minutes. Add broccoli rabe to the chicken broth and stir to combine. Add the pasta, 1/2 cup of Parmesan, pine nuts, parsley, oil, and lemon zest. Toss to coat, adding some of the reserved cooking liquid, 1/4 cup at a time, to moisten. Season the pasta with salt and pepper, to taste. Mound the pasta into bowls, sprinkle with remaining Parmesan, and serve. *To toast pine nuts, place them in a dry nonstick skillet. Turn on medium heat and stir constantly once you start to smell the pine nuts. You want them to be a toasty brown color; just be careful, as they burn easily. This isn’t something you want to walk away from as it cooks. On another note, look for pine nuts in the bulk bins at the grocery store – they’re much cheaper there than pre-packaged ones. Hot pepper jelly – You can freeze a few weeks’ worth of peppers to make this. I cooked up several jars of this jelly last year and can vouch for its tastiness. Pour over a block of cream cheese and you have a fantastic football-watching dip. Cucumber-radish raita – Serve with grilled or baked chicken. Okra patties – Similar to fried okra, but less of a pain to prepare. In my opinion, anyway. 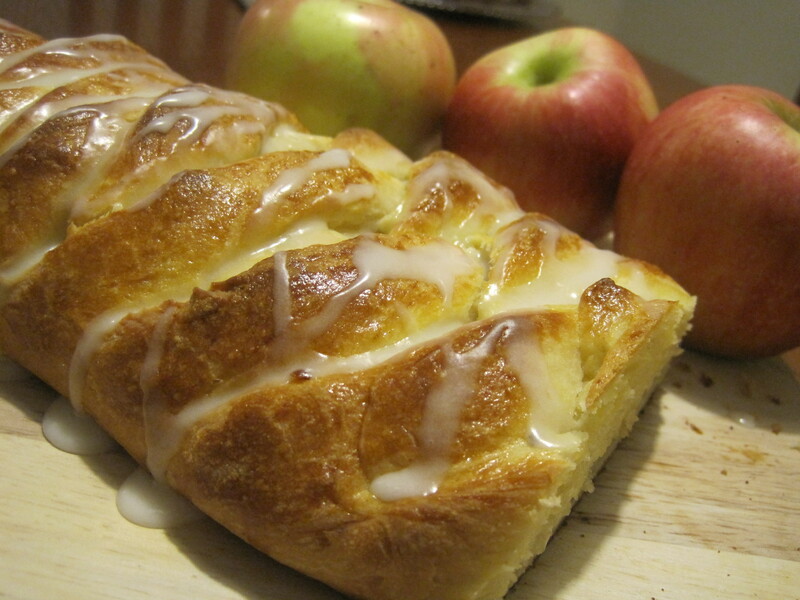 I made this easy apple danish for a friend’s baby shower at the office today. It’s a great choice for special occasions because the pretty presentation and sophisticated rosemary apple filling will make you seem like a gourmet chef! Local box favorites Golden Apples from Apple Country Orchards and Rosemary from Pure Luck Farms are the rock stars of this recipe. Although the braid looks tricky, it’s actually one of the easiest pastry shapes to master. 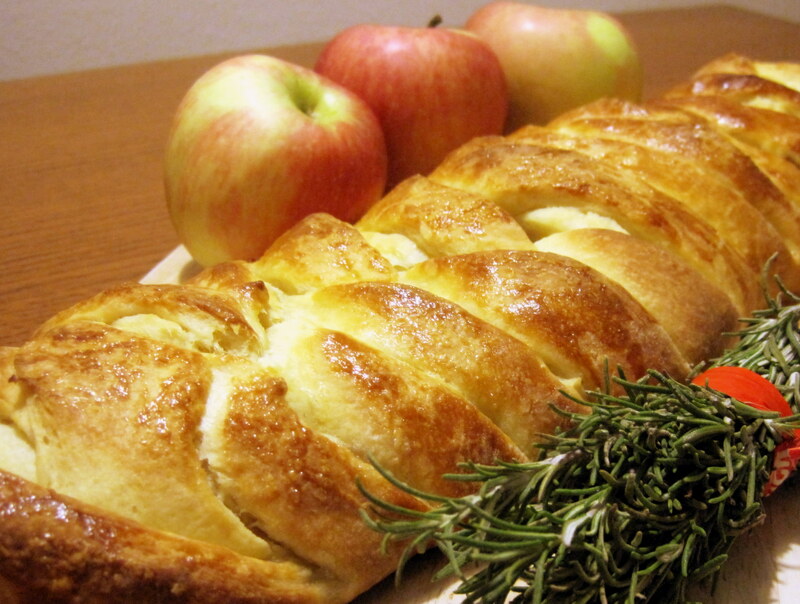 This recipe is adapted from Dorothea Ladd’s Easy Apple Danish on Allrecipes.com. I used a food processor and chose the braid shape to save time; my grandmother might argue that this simplified pastry dough is not a true danish since it’s not laminated, but it passes my family’s taste test for sure. Method: In a small bowl dissolve yeast in warm water. 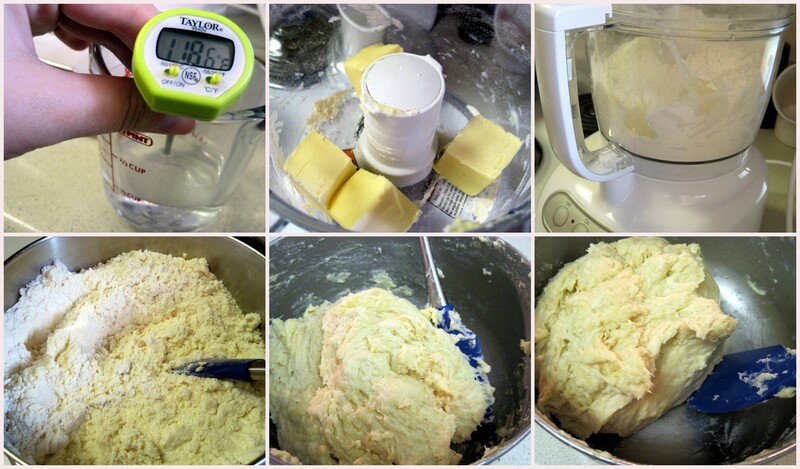 In a food processor, cut together cold butter, flour and sugar. For most food processors, you will need to do this in two batches. (If you don’t have a food processor, a pastry cutter or two forks will do the job.) Process flour and butter until mixture resembles crumbly, damp sand. Move flour and butter to a large bowl and add sugar. Stir in the yeast mixture, warm milk, and beaten eggs by hand. Knead the dough in the bowl with a spatula until it is elastic and well combined, about 3 minutes. Cover and refrigerate at least two hours. While dough rests, prepare the filling. 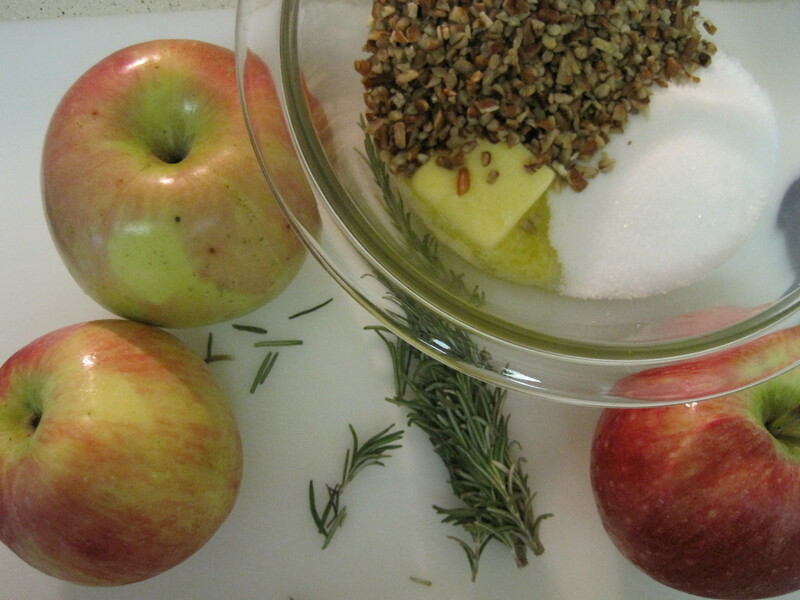 Chop apples, rosemary, and pecan. Combine the apples, rosemary, sugar, melted butter, and pecan pieces; set aside. Cover two 15-inch cookie sheets with parchment paper or silpat and set near your workstation. Punch down dough and turn it onto a lightly floured surface. Divide dough in half, set one half aside. Roll dough into an 15 by 12 inch rectangle. Transfer dough to prepared cookie sheet by gently rolling dough onto the rolling pin, moving to cookie sheet and gently unrolling onto the parchment paper. 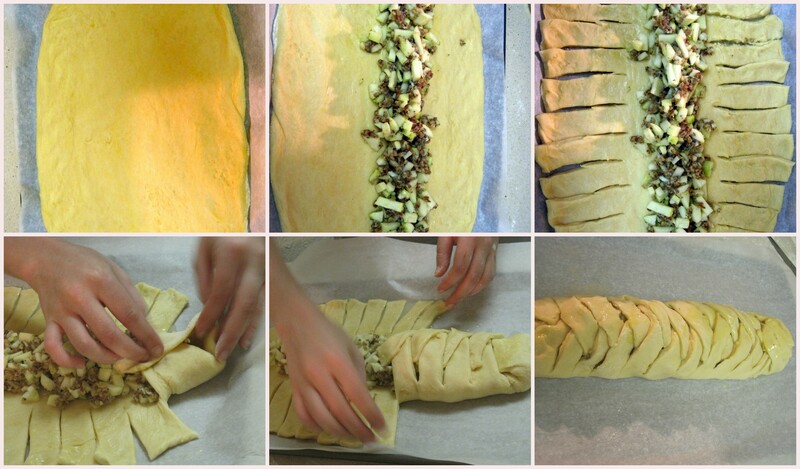 Place half of filling longways along the middle of the dough, to within a half inch of either end. Use scissors to cut dough into one inch strips along either side of filling, then fold alternating strips towards the middle of the loaf to create a braid effect. 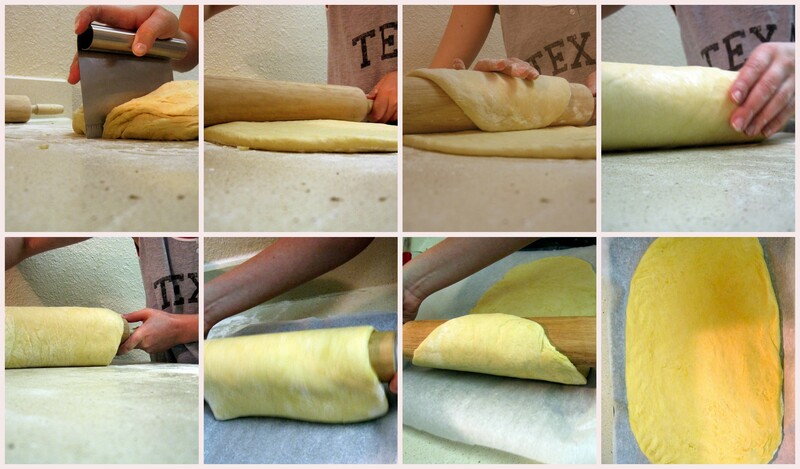 Repeat the roll/tranfer/fill/braid process with the other piece of dough. Set both braids aside to rest for about 20 minutes. Preheat oven to 400 degrees. Brush the braids with egg wash. Bake at 400 degrees for 20 minutes, or until golden brown. Allow braid to cool on the pan for 10 minutes before moving entire loaf and parchment paper to a wire rack to complete cooling. Prepare glaze by sifting powdered sugar into a small bowl. Whisk in milk and apple juice, and drizzle glaze over top of cooling pastries. Each loaf yields about 15 slices. This post is by The Austin Gastronomist and also appears on her blog. 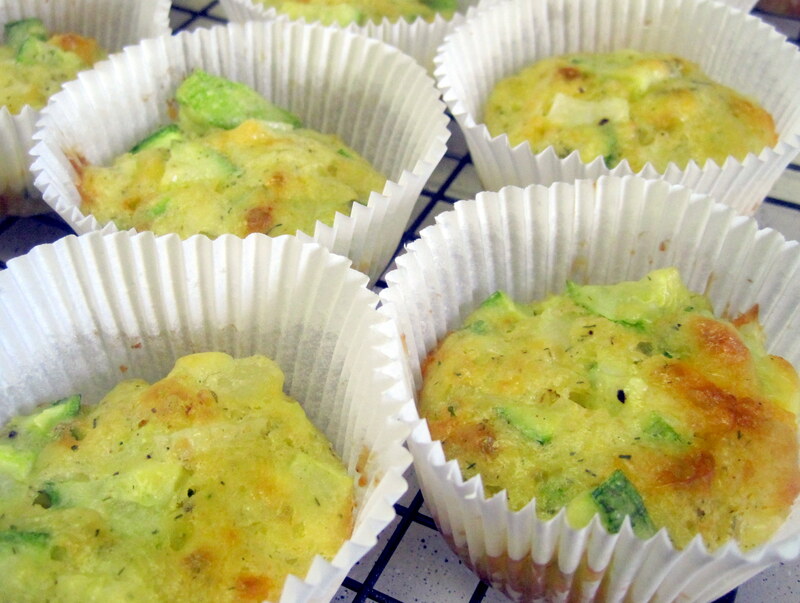 Mom’s summer squash – Not my mom, Elise’s (from Simply Recipes) mom. This recipe will use one of your bell peppers and an onion from the stash you got last week. LBJ Ranch pickled okra – It’s about that time of year when I start putting up okra for the winter. This recipe looks like the one I used last year, which I couldn’t seem to dig up. You can skip the hot peppers if you wish; I never taste them (but I also have a very high tolerance for spiciness, so trust your instincts on this one). Also, if you don’t want to actually can the pickles by processing them in boiling water, just put the jars in the fridge. These need to sit for at least six weeks before you eat them. Quick-braised greens with bacon – The original recipe calls for just collards, but your mixed goody bag of braising greens will work just fine. You can leave out the onion if you’re out of them; the bacon adds a ton of flavor on its own. Use center-cut bacon for a slightly lower-fat version.